A specific request from sonofsonofspock lead to me covering primers in part 3, this got a little longer than I had anticipated and so I pushed the discussion of brushes into a part 4. I am far from expert in paint brushes and constantly struggle with getting the most life out of the ones I have. For folks looking to explore a range of options, I'd offer this as a launch point and would love to hear feedback on options beyond this. So brushes... they're kind of a big deal (I'd insert a meme here but I'm too lazy... just imagine an anchorman shaped paint brush). These are what control the application of your paint most of the time, non-brush applicators I have tried include airbrush, spray cans, sponges, toothbrushes, pouring, tissue, fingers and dipping. Some of these are better options than others... and they all have specific use cases. Digression aside, you are going to get very familiar with brushes in this hobby and you will find different brushes have very different behaviors. I'd also like to mention 'materials' as this has also seen a lot of debate on forums regarding horse, hog, badger, squirrel, sable, kolinsky, synthetic... all different materials that the bristles can be made of. There are only three of these you should ever consider for mini painting - synthetic and sable are both great options for cheap brushes, kolinsky or kolinsky-sable is generally considered the finest of brushes and is really just a higher class of sable - they tend to be a little more expensive and probably not worth it unless you are able to keep your brushes healthy for a while. My first and biggest piece of advice is don't waste a lot of money on brushes until you know you can look after the ones you have. I have been painting for over 20 years and I still don't think I take enough care of my brushes (some of which are almost that old) to justify buying expensive brushes. Keep the ferrule of the brush 100% paint free. This is the most important thing to take from this whole article. It took me years to learn to load a paint brush in a way that won't get paint in the ferrule and I still don't succeed all the time. If you see paint going into the ferrule then immediately wash it out carefully and use your brush soap (see Lesson 5). Doing this will drastically increase the life of your brushes. Do not leave your brush in water. REALLY don't leave your brush bristles down in water. You are going to ruin your brush really quickly doing these things. Bristles can be bent and leaving the brush in water is a fast way to guarantee that. Water in the ferrule is not as bad as paint but it's still not great as it will eventually degrade the glue - some painters will insist on leaving the brushes suspended tip down using a gizmo like this. I have never done this and don't think it's really necessary but I do intend to try it once I have a more permanent set up to see what difference it makes. You know that little plastic cap on the brush? Chuck it. Sure, it may look like it'll protect your brush but I promise you that you'll do more damage trying to put that back onto your brush (bent bristles, brush not drying etc.) than you would if you just left it exposed to the elements. If you paint on the go / take your stuff to friends or your local store / just have to pack away your stuff all the time then buy a proper storage option for your brushes. You can get a brush case for less than $10 online so just do it. This kind of ties back to Lesson 1 but you need to rinse your brush frequently while painting. This is another thing I am still not so good at but over time (especially when doing a lot of painting with the same color) the paint will start to dry on the brush... this is really bad as this dried paint damages the bristles and can flake off and mix into other colors later on. For the longest time I was paranoid about trying to waste as little paint as possible which has instilled this habit of not washing my brushes often enough and it does shorten the life of a brush. It is hard for me to be properly objective about this one but I would strongly recommend using Brush Soap. 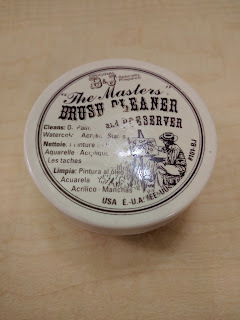 At the time I started using this I was making a bunch of other changes to my painting practices however a friend picked up Master's Brush Cleaner and Preserver for me and I started using it. 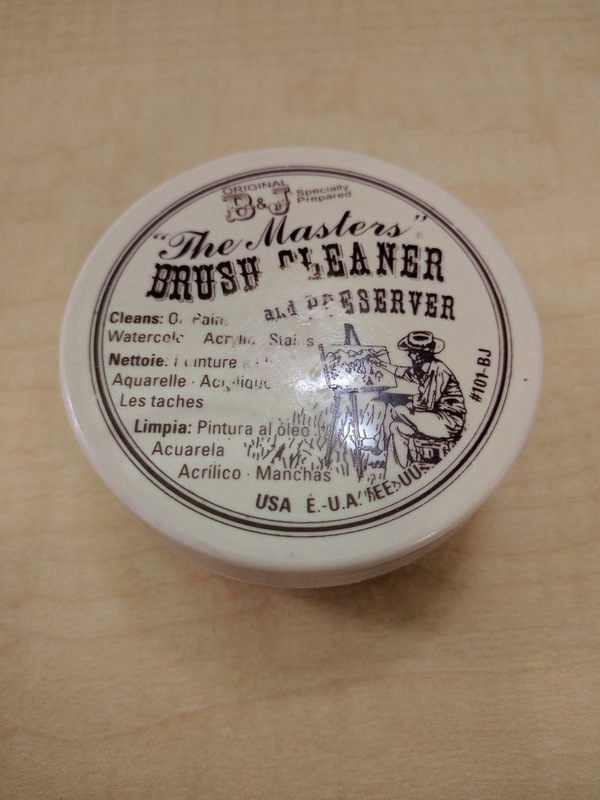 When I first got it, I sat down for a couple of hours and worked through all my old brushes to clean them up, the amount of crud that came off was remarkable, not just flakes but also more soaked into the brush causing the bristles to actually change color as they were cleaned. From then on I try to make sure to use the cleaner on my brushes at the end of every session and it seems to have doubled their life (in combination with the other care changes I made like getting better at keeping paint out of the ferrule, letting the brushes air dry without the plastic cover etc.). I use the 2.5oz pots not the 1oz or the tub. The reason for this is that it is small and portable whilst still allowing me to lay the brush on the surface of the soap rather than having to stab it in with the narrower 1oz pot. I am a 28mm-32mm figure painter for the most part, I don't do much in the way of big vehicles or monsters (and those I do tend to be airbrushed) so the brush sizes I am talking about is looking at these sized miniatures, you will need to adjust if you mostly paint busts / 54mm / 3mm etc. Note that I don't go below a 00 size. It isn't necessary. My personal opinion is that you should be able to paint a full on display piece with nothing but a single size 0 - the size 0 and size 2 should be doing the bulk of your work on every model - size 2 for base coats, 0 for detailing. I like the 00 for eyes and that's about it. When I was younger I used to try using a 00 for everything, thinking I would be more accurate but it just ends up taking longer. 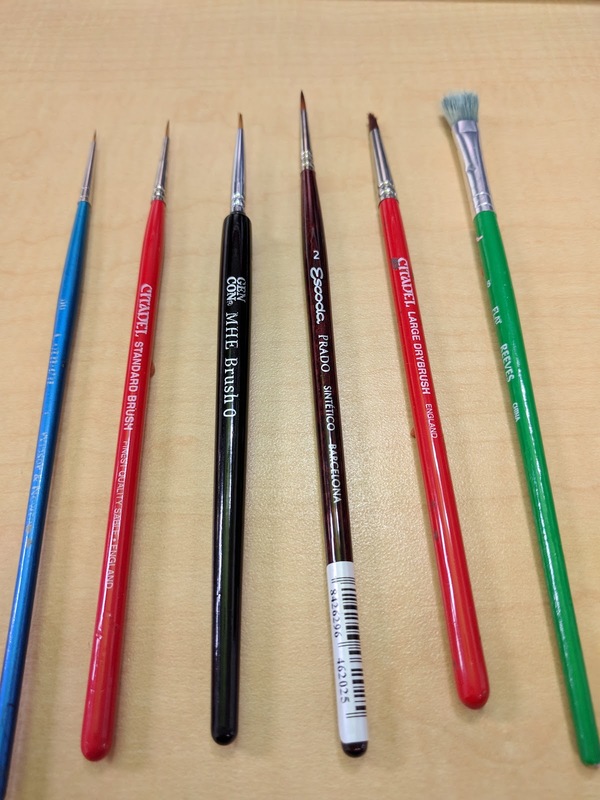 Why 2 of each standard brush? because mistakes... also two brush blending. Now both of these can be done with mismatched brushes (as testified by my lack of matching brushes) but it can be handy to have paired brushes that will behave the same on the surface. What do I mean by mistakes? Well if you keep one of the two brushes loaded with water, you can use it to remove paint when you make a mistake... if you are quick. This is the same process as artists will do with oil paints and turpentine but you have a narrower window as the acrylic is pretty well set once it dries. The way I do this is to dump a load of water on the area using the water brush to wash out the mistake, agitating the offending paint. Once the paint is lifted, drying the water brush and using it to wick up the watery paint on the model and voila 'Ctrl+Z' has been applied to painting. It is not foolproof and can be hit or miss depending on speed, drying rate, weather and paint manufacturer... also DO NOT use this to remove Metallic Paints!!! You will end up with a sparkly miniature (another reason I shun metallics). I should do a tutorial video on this paint undo option... maybe one day. 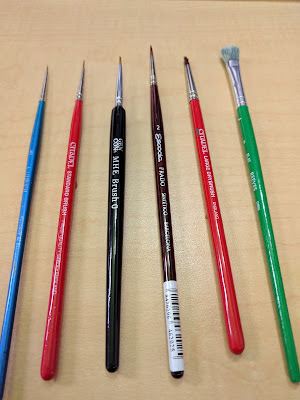 I started with the old red handled brushes and I still have a lot of these in my collection, it wasn't until fairly recently that I started experimenting with other brands. I still have a lot of my old GW brushes and happily use them. The newer brushes haven't worked for me at all. The price point is pretty high and if I am spending that much for a brush, I'd rather get something from Games & Gears instead. The brushes aren't terrible but they seem to focus on smaller brushes and all their brushes these days lack a decent belly so you aren't holding much paint. My new go to for 0 and 00 brushes. I discovered these last year at GenCon and have been very pleased with the results. The majority of their brushes have a removable handle that doubles as a cap making for very transportable brushes (be careful to make sure they are properly dry before putting away like that though). 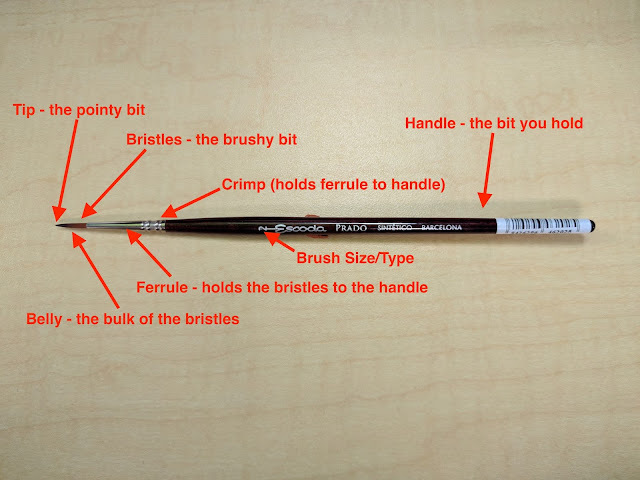 Art supply shops is one of the more affordable places to get brushes and I recommend that you try this method for your first few brushes in particular. They are generally cheap and because they are designed for a range of artists, I tend to find they have a bigger belly to the bristles allowing more paint retention. You may struggle to find 0s or smaller as they are less demanded than a 2 or 1 size brush. I have not used these and flat out refuse to spend that much money on a single brush but plenty of people do. I mention them here as anyone looking at miniature painting brushes will see the name on the web. These, like the Windsor & Newtons - I have not had the opportunity to try these. They are substantially cheaper which is nice. If I get the chance I would happily give these a go. My experience of the online community is a clear split between cheap and disposable and super expensive. I tend to be more on the former side. I firmly believe that good habits will serve you a lot better than a 'good' brush. I may well take the plunge with these when I feel like I am disciplined enough to justify it... that's still years away for me. I also don't go super cheap unless it is for something like big terrain pieces. Games & Gears have hit the sweet spot for me, a good price point for Kolinsky Sable that holds a good point. Once again, this post has proven to be longer than I expected, there may be one more post covering varnishes but this is likely to be a little while before it materializes.